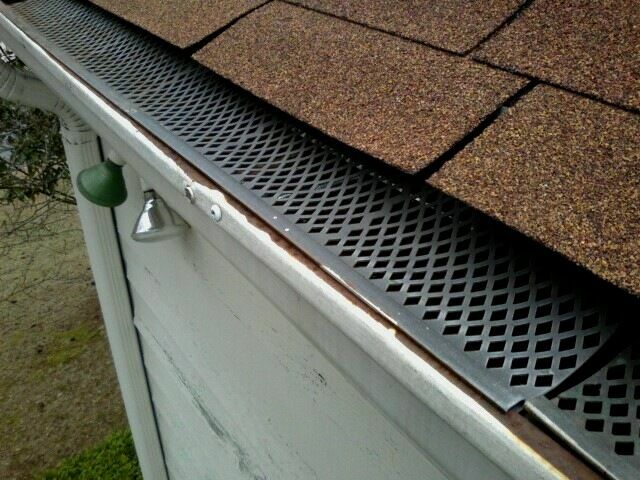 These rust-resistant screens, often commonly referred to as gutter guard, snap on to the existing gutter's outer lip and arch over, resting atop the edge of the asphalt roof. Debris falling down the roof collects where the screen meets the roof. When water runs down the shingles, it flows over and through the collected debris and strains down through the screen. These screens don't keep everything out, for small things will still get through, but most of the debris will be blocked. 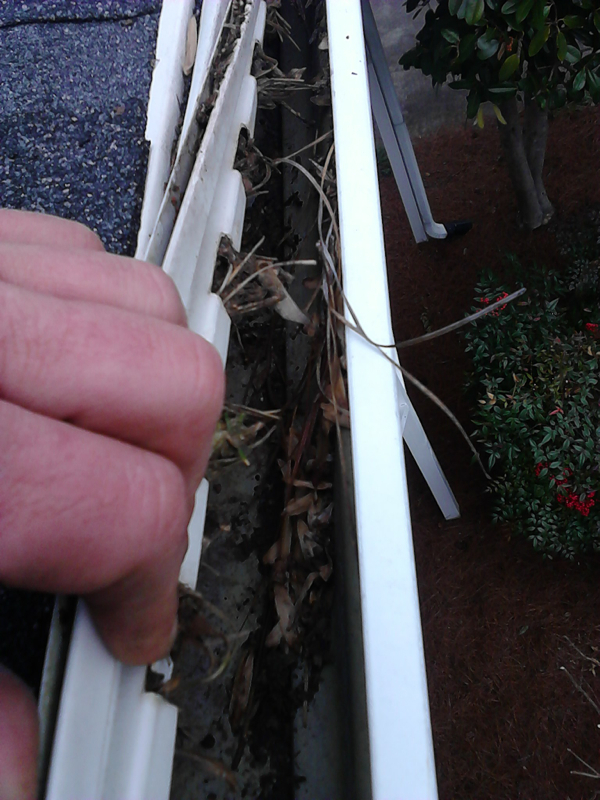 These screen prolong the average gutter cleaning by six months to a fully year. (Depending on how many trees surround the home). This installation usually pays for itself within 2 years of install. 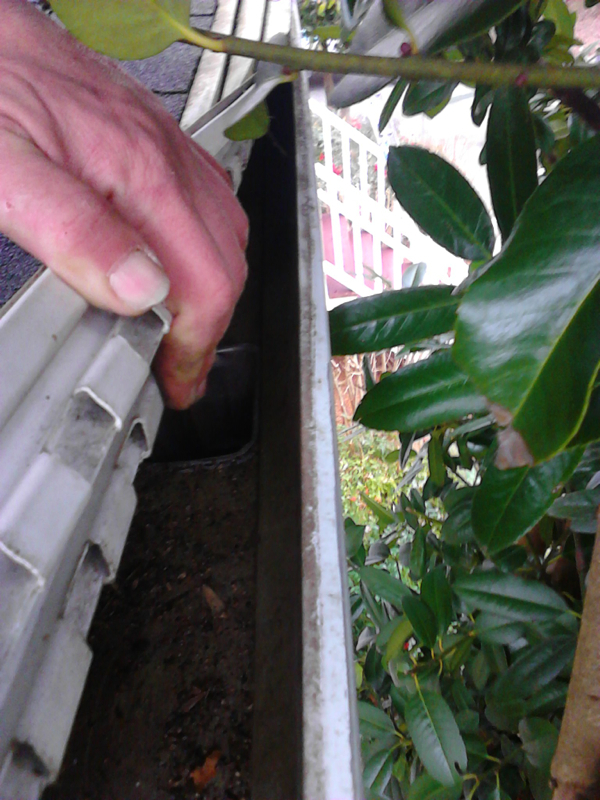 There is no guarantee of exactly how much will be kept out of the gutter and for how long, as every customer's home and tree situation is different. In addition to regular screens for aluminum or galvanized gutter systems, we install half-round copper screens for copper gutters. Call us about pricing! We do not install flat screens because we find them to be an ineffective product. As for plastic and vinyl screens and covers, there are more details below. 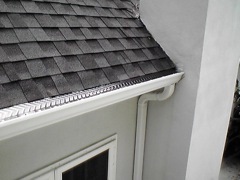 There are over 20 fully covered aluminum gutter cover lines available. We've tried several till we found one that does what its manufacturer claims it will. 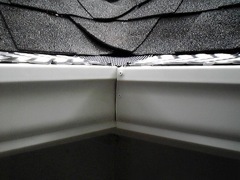 The brand of guard cover we install is attached to the outer lip of the gutter by screws and goes up under the shingle. Debris falls down the roof and slides right off the edge. 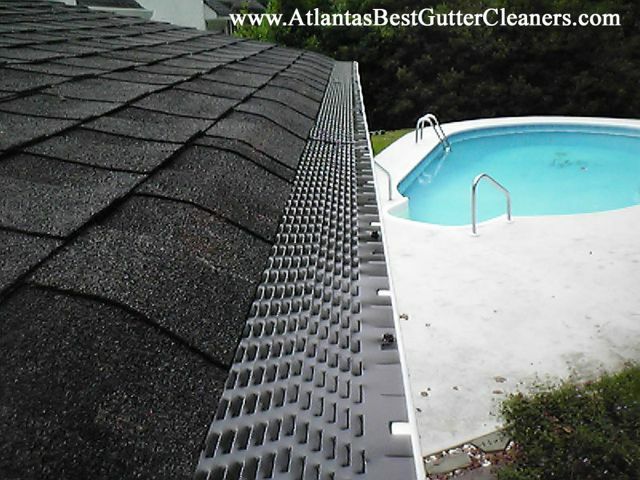 We give you a written guarantee that the inside of the gutters wont need a cleaning for the next 5 years (longest of any company in Norcross) or we come out and do the cleaning for free. 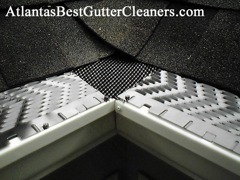 When getting a cover system (not screens) on all the gutters on your home, your cleaning before installation will be performed at no extra charge. 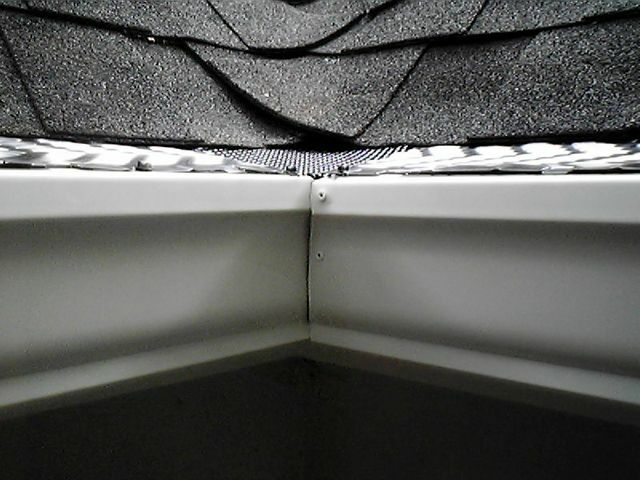 Installation of the covers must occur within 30 days after a cleaning, or cleaning must not have been performed longer than 30 days from the installation date. ARE COVERS 100% MAINTENANCE FREE? This is a difficult question for each customer because, in almost all cases, the covers are 100% maintenance free. There are some variables than can require the covers to have the need of a "cover cleaning." 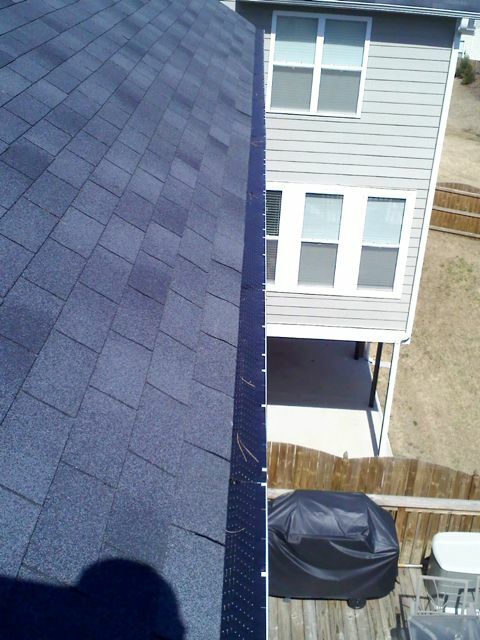 If your roof is the type of roof that gets covered by debris, especially during the heavy falls seasons like Winter (Nov 15 - Jan 15) or Spring pollen season (Mar 15 - May 15), then you could have issues with debris not only falling on the roof and staying, but also falling on the cover and staying. 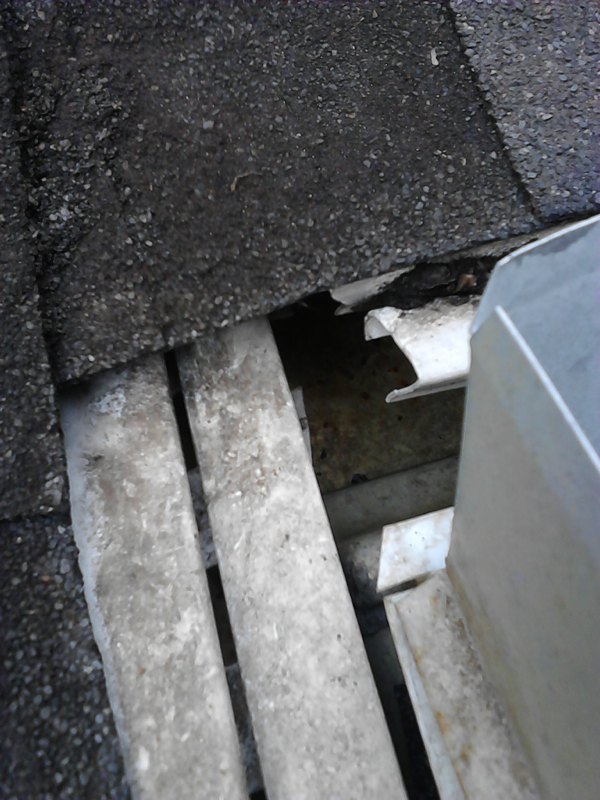 The debris stays on the cover because (1) the pitch of the roof is not steep enough to slide off or (2) so much debris falls at one time, it compiles and does not have the chance to slide off before becoming weighted down. 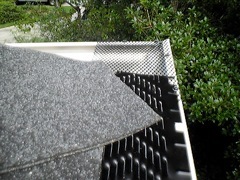 In these instances, the covers just need to be blown off, in the same manner that your roof would need to be blown off. 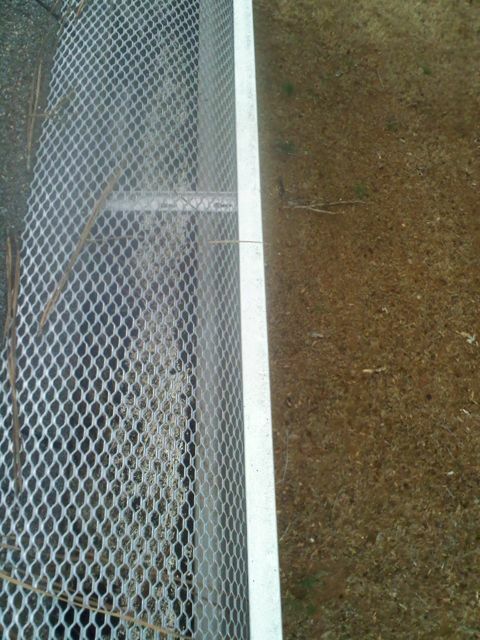 The cover still does it's job of keeping debris out, but if it gets covered itself, then access needs to be restored by blowing off the top of the cover. When this is necessary, it is normal expected maintenance for a cover of this design and not a failure of the cover, but this is only an issue for homeowners the receive exception falling of leaves and debris in short periods of time or the pitch of the roof is not steep enough, about 1 out of every 500 customers. Our expert crews will make a recommendation on whether one system is better for you than another, or if you even need one at all. 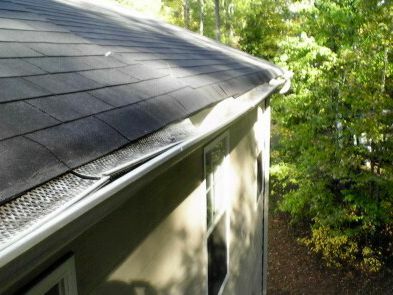 Many homes do not require the extra expense of a screen or cover system and only need a regular and consistent gutter cleaning service. We believe in giving honest opinions and finding the right solution for your home, and we never use any high-pressure sales methods. 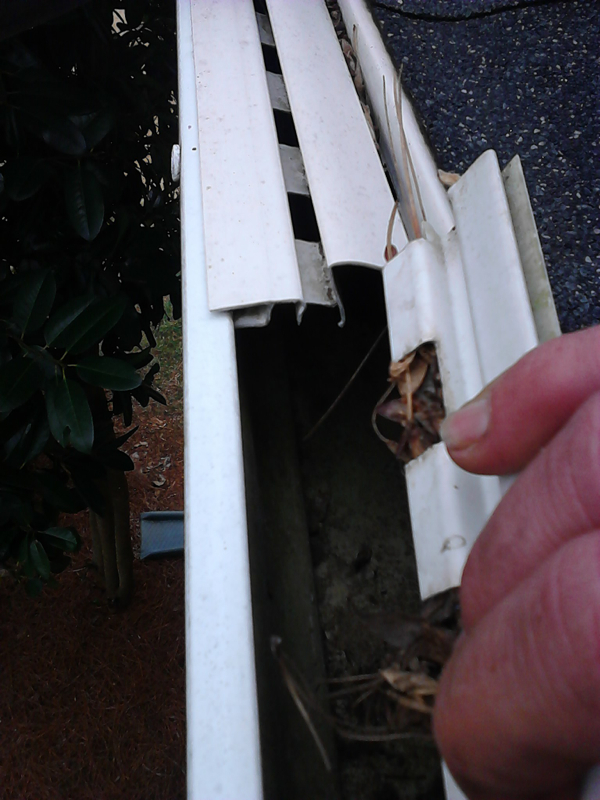 Screens are more affordable, but they don't keep all the debris out of the gutters, just a majority. With screens, you will still need to clean the actual gutters out, but nowhere near as often. Our fully covered system will guard your gutters from the debris entirely, but it is more costly an investment. Average homeowner needs to live in their home by at least 5-7 years to get their value from the covers. If you do plan to stay in the home that long or longer, then covers could be a valuable investment. 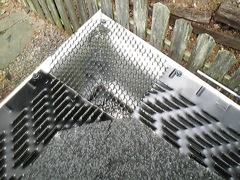 We do not install plastic products such as screens and covers and do not recommend them to anyone in Georgia. 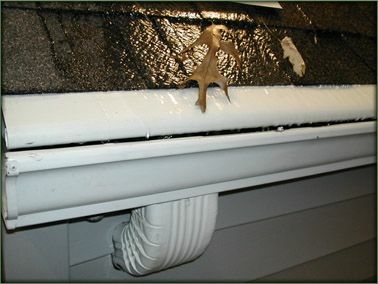 The plastic covers you can get in most hardware stores are extremely ineffective when it comes to keeping debris out of your gutters. Further more, they tend to warp and change shape due to extreme heat exposure in the summer months. The affect flaws the design, making them completely ineffective. As a professional policy, not only do we not provide the plastic style, but also we must refuse offers to install plastics you have purchased of your own accord. They are a waste of money and if you have purchased them, you should return them for a refund. 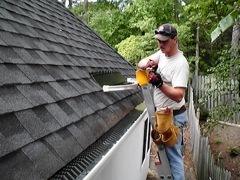 Description of Work: Gutter cleaning and installation of gutter guards. "The two young men arrived at my home earlier than the stated appointment which was great. They immediately got to work. I have a multi story home but they were able to maneuver on the roof with no problems. 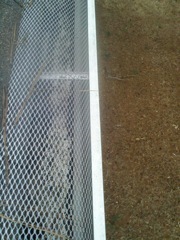 I had asked for a quote for the gutter guards and one young man went about measuring linear feet for an accurate quote. They were able to complete the cleaning and installation of the guards that morning. 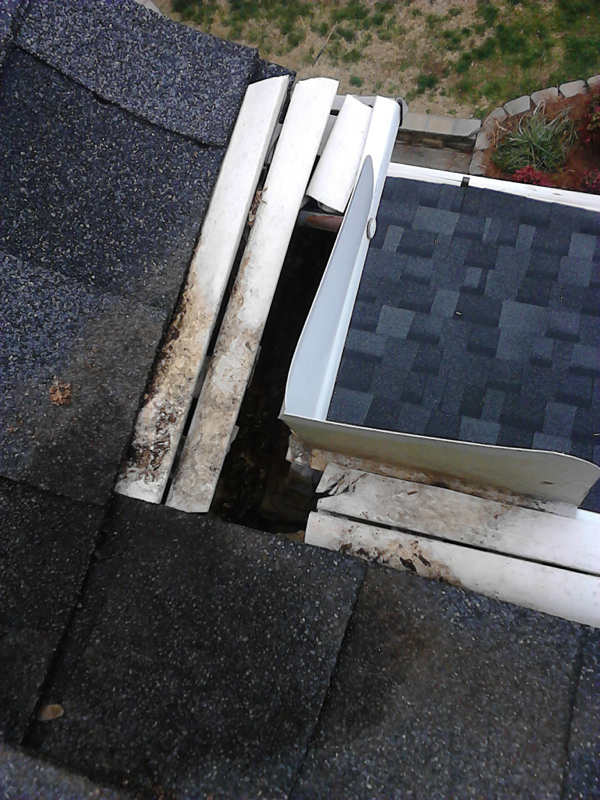 They even cleaned up any residue that fell from the roof during the cleaning and any scraps from the gutter guards. They did an excellent job. The timing was impeccable as the Great Flood of 2009 rains began falling the next day. 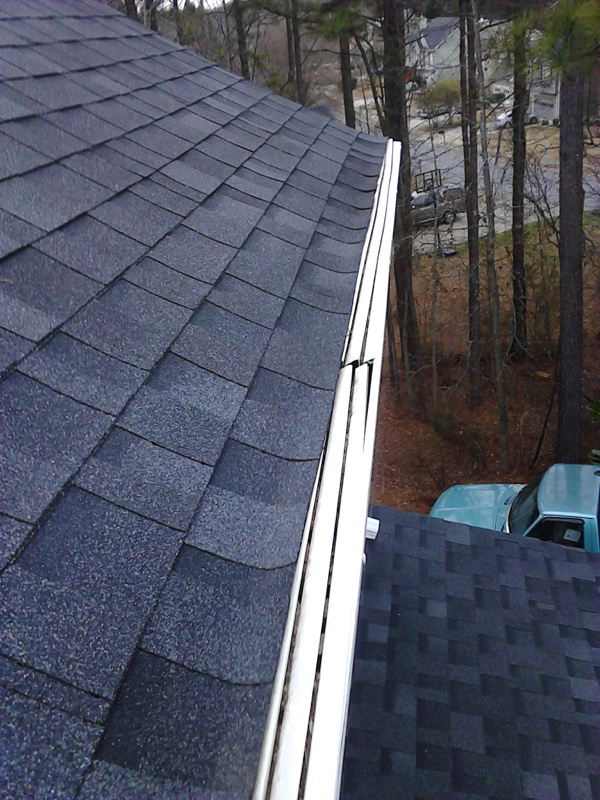 I am happy to report that the roof runoff came pouring down the downspouts with no interference from pine needles and/or leaves." 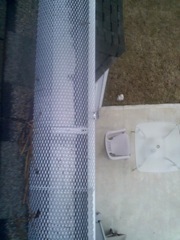 Description of Work: They cleaned out our gutters, removed the old covers and replaced them with their gutter cover system. 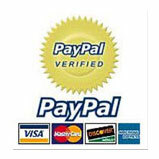 "The entire experience was great. From the folks we spoke to on the phone to the crew at the house, everyone was kind, responsive and polite. 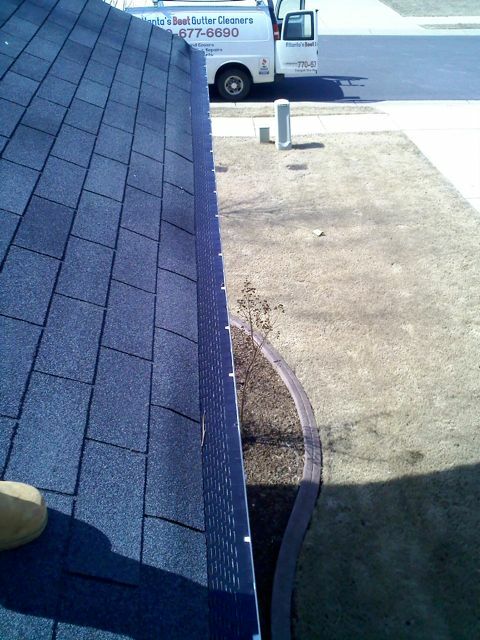 They did a great job and we're very pleased with the work and quality of the product." Sadly, a good portion of our business comes from helping homeowners who have been taken advantage of by being sold products they are promised and guaranteed to work, but end up failing them in the end. The reason is that these covers work under the physical theory of surface tension, the idea that the water will follow the bath of the fully covered product's curvature and fall backward into the end of the cover. Actually, except for in torrential downpours, this is a sound scientific theory. Where the cover fails is when it is actually applied on a house. You can watch an indoor model of the cover working for days without problem, but of course those covers are wiped down every morning. Anytime you see a company's video showing how the cover works, the video was taken the day it was installed, and the cover was completely clean. 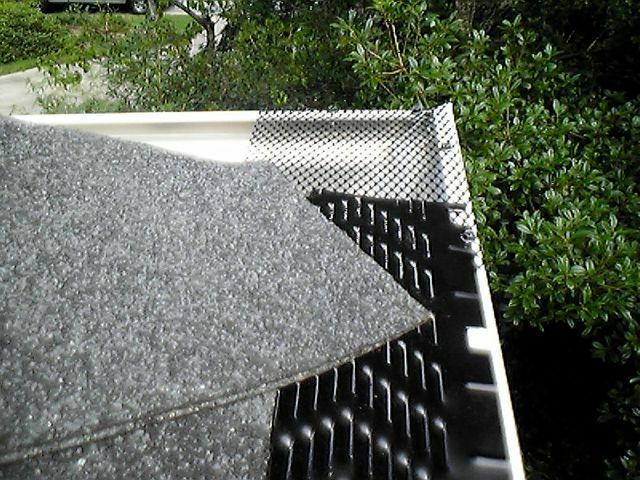 The covers that are actually on roofs get dust, dirt, grime, leaves, pollen, and tree sap all fall on top of the cover, creating a filmy layer of filth that completely ruins the surface tension. When water goes over the cover, the dirt on the top divides the water's path, creating stronger currents and preventing the surface tension to work. After only a couple of years of collecting dirt, the gutter system now behaves as if it doesn't have gutters at all. In most cases, the system will work perfectly as described at sale if you hand-clean the top of the cover every two months. 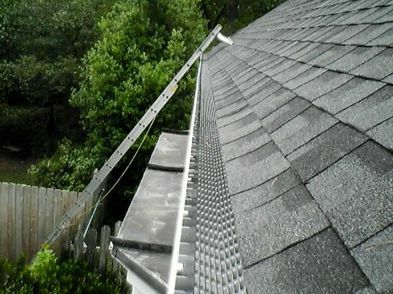 Most homeowners do not have the time for this. After the company they hired to install them either goes out of business, changes its name to avoid warranty issues, or simply refuses to handle the issue, homeowners call on us. 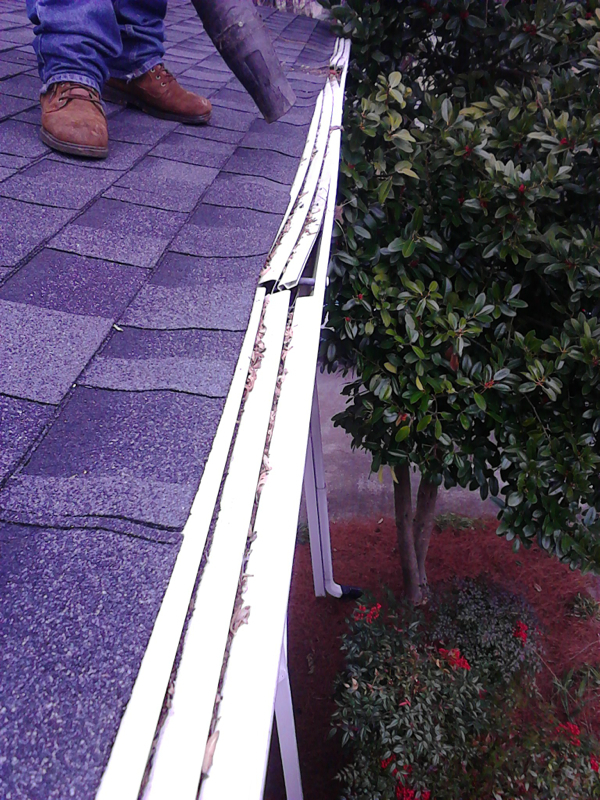 We typically charge $350 - $450 to remove these systems, depending on the exact footage, or we do it for free if we are installing our gutter cover system, which actually does work. 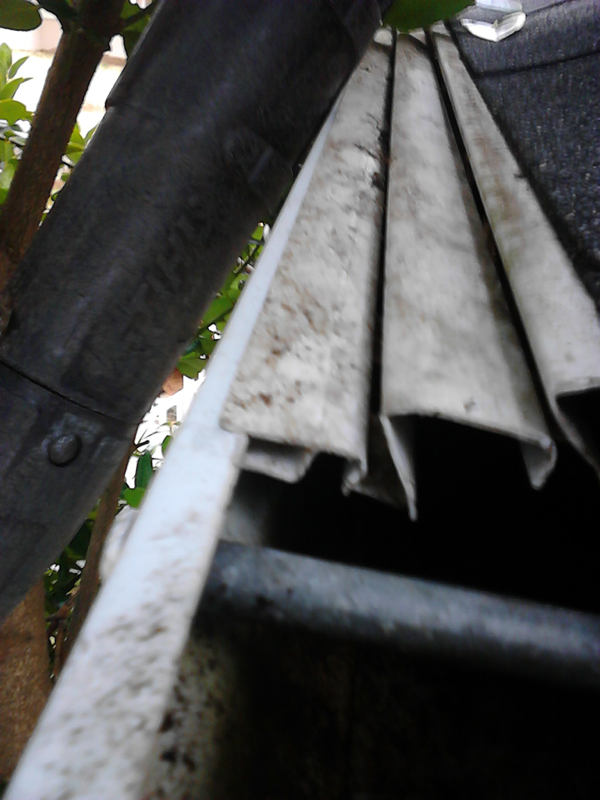 We remove the system in a way as to not damage the gutters or roof, and we can dispose of the covers for you or leave them if you wish to recycle them. 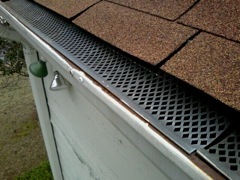 In the end, your gutter system will work better without these fully covered style no-clog covers.